PA's UN mission delays the delivery of a batch of newly signed treaties until Friday, with no reason being given for the delay. The Palestinian Authority’s (PA) UN observer mission has delayed the delivery to the United Nations of a batch of newly signed treaties, Reuters reported Wednesday night, citing a diplomat at the mission. The delivery of the documents was originally planned for Wednesday but has been postponed until the end of the week. The diplomat, a legal adviser at the Palestinian mission, offered no explanation for the delay until Friday. 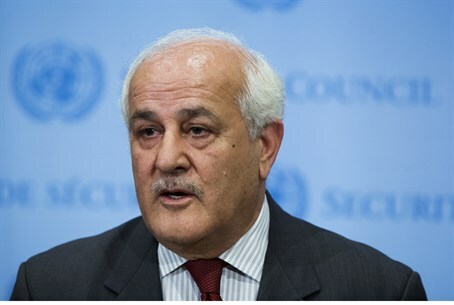 The mission had earlier announced that the PA observer, Riyad Mansour, would present the treaty instruments to Secretary-General Ban Ki-moon's office at 4:45 p.m. Eastern time on Wednesday. Earlier Wednesday, PA Chairman Mahmoud Abbas signed a request to join the International Criminal Court (ICC), as well as applications to join 20 other international conventions. The PA has hoped that ICC membership will pave the way for "war crimes" prosecutions against Israeli officials for their presence in Jewish areas of Judea and Samaria. The move came a day after the PA’s attempt to impose a Palestinian state on Israel through the United Nations Security Council failed, when only eight member countries voted in favor of the resolution, one short of the required number of votes to pass. Prime Minister Binyamin Netanyahu responded to Abbas’s turning to the ICC by saying that Israel has little to fear from the PA signing the Rome Statute and that the PA has everything to lose. Despite the constant threats to turn to the ICC, PA officials realize that doing so is a calculated risk because it would give Israel a forum to pursue war crimes charges against the PA as well and particularly against Hamas. In one interview, the PA's envoy to the United Nations Human Rights Council (UNHRC) admitted the PA has no hope of pressing charges against Israel in international courts - because Palestinian terrorist groups are far worse violators of international law themselves.